← Can new washi tape make you Happy? It’s time to create Christmas cards. Yee-haa, that time of year again – am I right? There are some really cute ones to buy these days, especially if you order from Etsy, but who planned for this in say, October? Raise your hand if you did? I’m a last-minute kind of gal, so I find myself in need of sending something ASAP – and I do love handmade. It would be quicker to go out and buy a 10-pack santa postcards, but those are so boring! Am I right? All work and no play doesn’t just make Jill and Jack dull, it kills the potential of discovery, mastery, and openness to change and flexibility and it hinders innovation and invention. This year I managed to put something together while hosting a Christmas Card Workshop. I recycled an older idea of snow men and made due. If you want to create your own Christmas Cards, it’s not too late (if they’ll be sent within your own country at least). Use the weekend, eat some gingerbread cookies and create something simple that says “jolly (good enough) Christmas Card”! 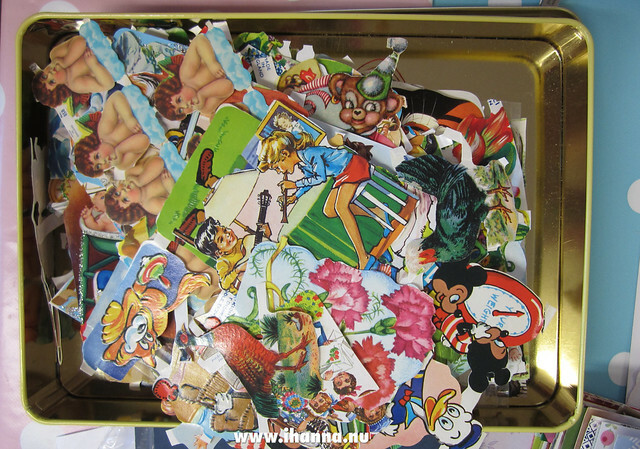 I love digging through the vintage scrap die cut images, to use as collage elements on cards. But for my own cards, I made snow men! This is a simple and quick idea. On colored card stock I painted two big circles using white acrylic paint. Once that was dry I started decorating with markers, tape and some orange paper cut outs for the “nose”. So cute! I also added some festive hats to my snow men, and in the end I couldn’t help myself so I also added some glitter. 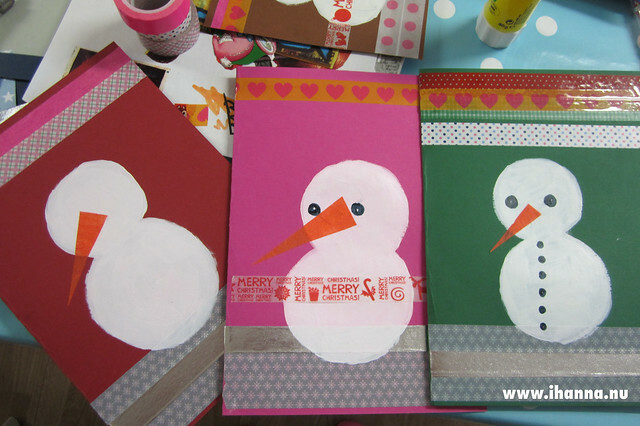 A few years ago I used the same idea, but using a home made stencil for the circles, on Smiling Snowmen Gift Tags. 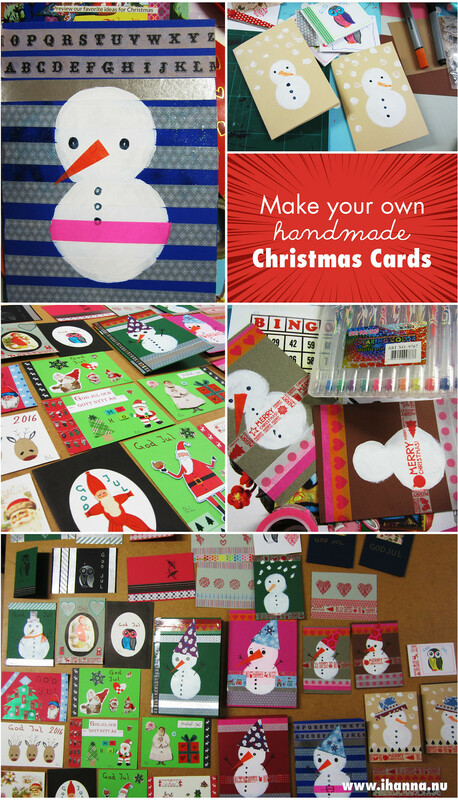 Loved the look of those, loved the look of the handmade Christmas Cards! 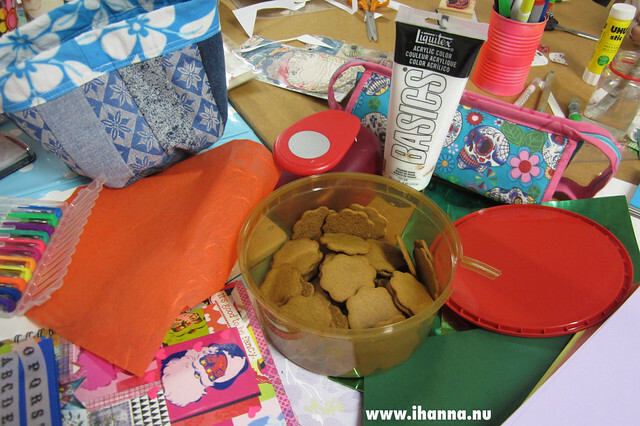 And adore the look of my messy work table, coffee, ginger bread cookies and all… Yum! Together with my crafty group we managed to make quite a range of different kinds of postcards, using stamps, cut outs, tape, collage elements, recycled santa images and more. I always say I’m not a Christmas craft type of person, but making postcards with a few other crafty peeps makes the whole adventure more fun! My Craft Idea Christmas – follow this lovely board on Pinterest, love these cute ideas! This entry was posted in Life Stuff, Mail bliss, Paper Crafting and tagged christmas, christmas craft, postcard idea, workshop. Bookmark the permalink. Your cards came out very cute and festive! Glad you had fun creating them! 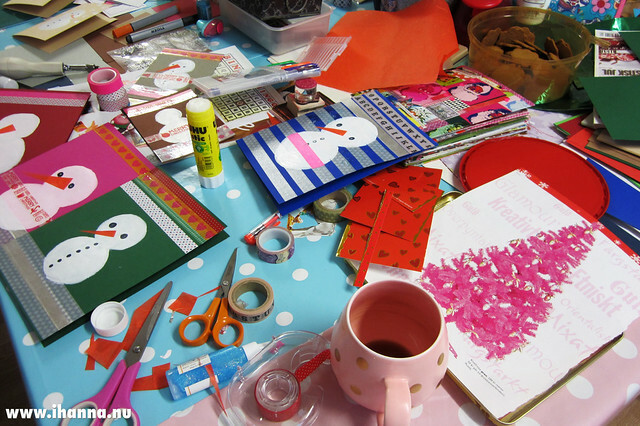 Thanks for sharing your wonderful photos (it feels like we were crafting right alongside you!) and thank you for sharing your creativity and inspiration with us! Hope you had a happy Christmas and New Years!